I can confirm through 1st hand knowledge that volunteer searchers have been asked to return to Kmart. sounds like they're calling off the search...sigh..
my daughter is with the family right now and she has informed me the police called them and wants the family together right now. the police are on their way to talk to them. OMG im so afraid. Oh, Klaas, I am so heartbroken. So unbelievably heartbroken. i'm trying to keep hope, but i don't think they sent out any ambulances....searchers sent back to k-mart...rounding up the family....oh.. This baby is with God. She is safe. She is not at the whim of her useless crackhead Mom. 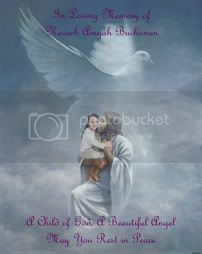 I pray for our strength, and for us to remember that Nevaeh has left us with a job to do; for which I humbley volunteer. So utterly heartbreaking. Sweet Dreams "Heaven" in Heaven. Just as the reward money was upped, a tip came in. Not sure if someone saw the body floating or if they knew more details of the crime. when will this stop? one more little life taken. Nevaeh, a little girl named after Heaven, only five years old. she made art, loved her grandmother (and green grapes) and playing with her friends. this little girl was our child, any child. one more shining light put out too soon. my heart breaks.